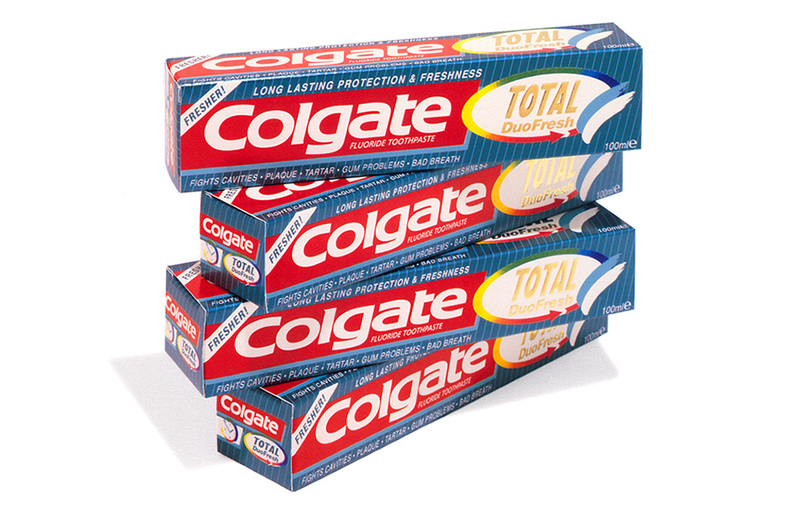 The most successful international brand in Colgate history needed to expand its product line. In a competitive and mature personal care category, there needed to be a clear brand message and carton graphics on the package. Profit margins are aggressive and pricing can be close. New variations, such as gel, sensitive and brighteners, along with new oral care products, continually impact the already crowded category in this mature marketplace. Brand message, product shelf locations, colors, graphics and type are all critical aspects when evaluating and considering a package. CrossRoads Studios was up to the challenge. Conducting a thorough review of the category provided useful market information and background. The graphic solution built on Colgate Total’s established equity, while clearly distinguishing the striped gel as an exciting new cavity fighter. A colorful Total visual element was created and developed. The red and white Colgate colors were incorporated with the carton design. Together, all the details worked in unison to clearly communicate the brand’s value and category differentiation.